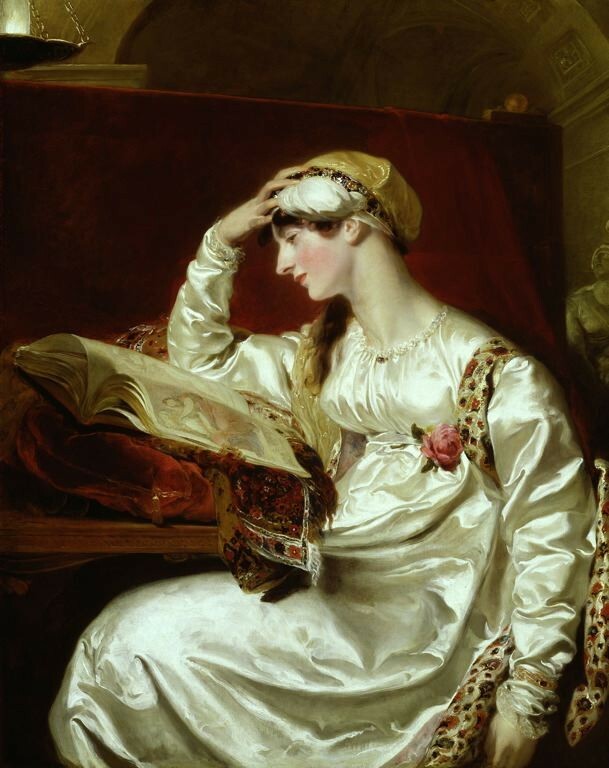 Sir Thomas Lawrence, (Isabella) Mrs. Jens Wolff, painted 1803 – 1815. © The Art Institute of Chicago, Mr. and Mrs. W. W. Kimball Collection. She sits in profile, rapturously contemplating an art book, brightly illuminated by a hanging lamp, the dark mysterious recesses of an arch behind her. An artist wants a picture to tell its own story; but we, the viewers, the readers, the audience, we lap up gossipy biographical details that add to our emotional titillation. Lawrence and the willowy, poised divorcee, with her distinguished aquiline features and slim modern figure, her intelligent expression and taste in contemporary and Renaissance art (her rapture is ostensibly aroused by studying Michelangelo, not by her consciousness of being studied herself) were bound in a relationship that lasted till his death. Thank you, again, Sarah for your patient loyalty and exposing the series (which has been excrutiating to write) to FND’s followers and admirers – the reaction has amazed me. I even Like it on YOUR blog! Excruciating or not, it was well worth it, Pippa. It’s such a treat to give your writing a wider audience, and my followers, bless ’em, are wonderfully loyal and interested in so many different subjects, as are we. Magnificent … and I loved the bit of history behind the work!!!! !